I always loved the “Live long and prosper” blessing from Mr. Spock. Here he explains what it is all about and where he saw it for the first time. 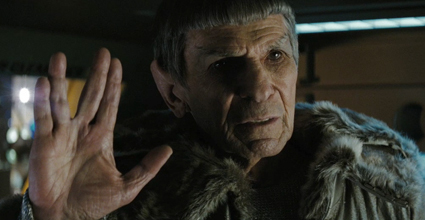 “The Vulcan salute remains one of the classic, defining, iconic gestures in Star Trek. 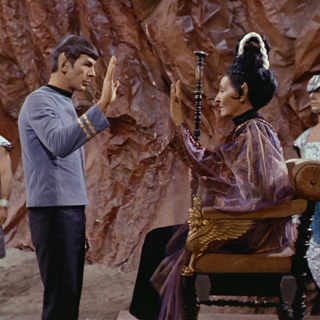 It’s been seen repeatedly across the franchise, often accompanied by the words, “Live long and prosper.” Leonard Nimoy – borrowing a page from an ancient Jewish ritual he observed as a boy in his native Boston — introduced the salute in the episode “Amok Time,” in a scene in which Spock greets T’Pau (Celia Lovsky), the Vulcan official who was to preside over his wedding to T’Pring (Arlene Martel). Nimoy had no idea at the time, as he stood on the set of “Amok Time” with Lovsky, William Shatner, DeForest Kelley and director Joseph Pevney, that he’d be setting a pop culture moment in motion, but that’s precisely what he did. StarTrek.com asked Nimoy if, in time to celebrate the upcoming Jewish holidays of Rosh Hashanah and Yom Kippur, he would pen a firsthand account of what he saw as a child in synagogue that years later led him to create the greeting. To our great pleasure, the Star Trek legend agreed to do so for those who’ve not heard the story or read it in his autobiography. He also was kind enough to set up the context in which he raised the notion of the gesture to Pevney during the “Amok Time” shoot in 1967 and to address the oft-asked question of whether or not Star Trek creator Gene Roddenberry had any role in its creation or signed off on it. I grew up in an interesting inner-city neighborhood in Boston. The area was known as the West End and was written about in a book called the Urban Villagers. It was a desirable area since it was within walking distance of downtown Boston and the Boston Commons, as well as being situated along the banks of the Charles River. The population was mostly immigrants. Maybe 70% Italian and 25% Jewish. My family attended services in an Orthodox Jewish Synagogue, or “Shul.” We were especially attentive to the high holidays, Rosh Hashanah, the Jewish New Year, and Yom Kippur, the Day of Atonement. Since I was somewhat musical, I was hired as a young boy to sing in choirs for the holidays and I was therefore exposed to all of the rituals firsthand. I still have a vivid memory of the first time I saw the use of the split-fingered hands being extended to the congregation in blessing. There were a group of five or six men facing the congregation and chanting in passionate shouts of a Hebrew benediction. It would translate to “May the Lord bless you and keep you,”…etc. I learned later that it is believed that during this prayer, the “Shekhina,” the feminine aspect of God comes into the temple to bless the congregation. The light from this Deity could be very damaging. So we are told to protect ourselves by closing our eyes. And when I saw the split-fingered gesture of these men… I was entranced. I learned to do it simply because it seemed so magical. It was probably 25 years later that I introduced that gesture as a Vulcan greeting in Star Trek and it has resonated with fans around the world ever since. It gives me great pleasure since it is, after all, a blessing.